The Utah System of Higher Education sponsors the Step Up website to provide information to students and families on college planning. The website has the usual check lists by grade, high school course recommendations, financial aid definitions, state scholarship information, and a listing of two and four-year colleges in the state. Step Up refers users to the Utah Futures.org website for calculators, assessments, and portfolios. Some of the features such as the portfolio requires a state student ID and login. However, the financial aid sort, value of a college education calculator, and school comparison don’t require a login. It includes a link to the Utah Higher Education Assistance Authority calendar of events on how to pay for college. There isn’t a general site for community college articulation and transfer agreements. The University of Utah has information on transferring from specific institutions on its website. You can find out information on exchange programs between Utah and other states at the Western Interstate Commission for Higher education. There are 11 four-year Utah colleges with 500 or more full-time undergraduates. Four of the Utah Colleges are private and 7 are public universities according to the Integrated Post-secondary Data System. Of the 137,540 students, 47.3% attend private colleges and 52.7% attend public universities. The average four-year graduation rate for private Utah colleges was 39.5% and the average five-year rate for public schools was 29.8%. 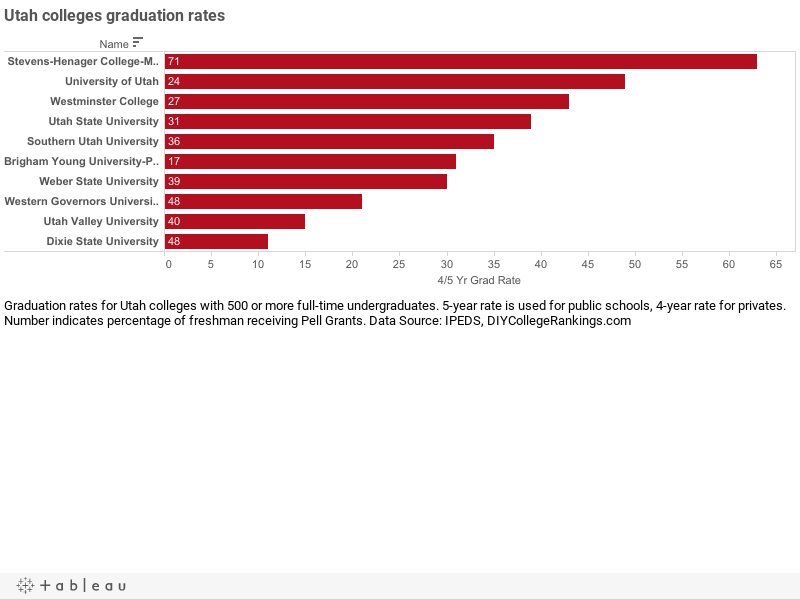 One Utah college meets the DIY College Rankings 50-50 profile requirements. College-bound seniors in Utah had an average of 20.8 ACT Composite score with a 20 for English and 20.3 for Math. The 75th Percentile scores were a Composite of 24, 24 for English, and 24 for Math. A total of five colleges ACT 75th% Composite scores were at or above this level.